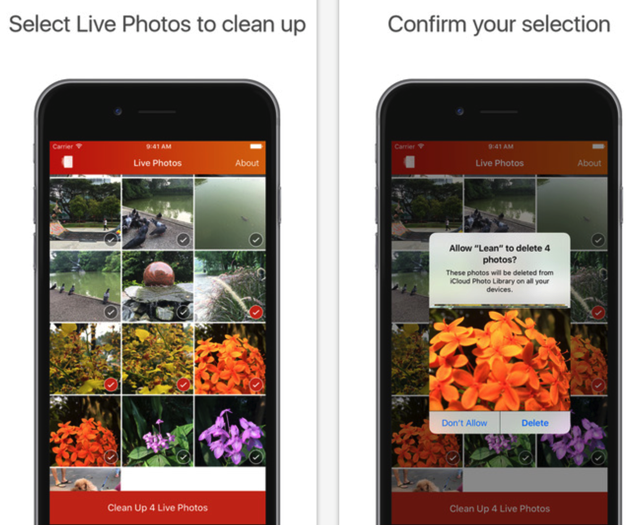 A simple new app called Lean by Tiny Whale discovered by the folks over at MacStories, lets you convert or ‘clean up’ Live Photos captured using an iPhone 6s / 6s Plus into normal, still photos by removing video from them. The app is available as a free download in the App Store, and enables you to save a Live Photo as a static one with no video and original metadata intact. Using the Lean app, you can select multiple Live Photos at once and then clean up with the tap of a button. The app saves a static version of the photos in the same position as the original without creating a copy, while also keeping EXIF, GPS, and Creation Date data after the conversion. The app also tells you how much storage you’ve saved and even allows you to peek at Live Photos from the main view.